« Markakis Signs, WTF is a Felix Pie? Who says rookies can’t win? Rookie head coaches, rookie quarterbacks, whatever. The ROOKIES RULE moniker could apply to the NFL in general for 2008, as the Atlanta Falcons, with Mike Smith and Matt Ryan, kept up with the Ravens every step of the way throughout the regular season. In Baltimore though, John Harbaugh and Joe Flacco set new standards for first year excellence, winning 13 games total (regular season + post season). As a result, we are already seeing the trend of hiring first-time head coaches continue to grow – don’t be surprised to see several more teams going with rookie signal callers on opening day 2009. Joe Flacco. “Wacco for Flacco” signs strewn around Charm City. My fantasy team’s name was “Unibrow Power.” I had the idea several weeks ago to start selling fake unibrows at Ravens games, but since I’m lazy, somebody else beat me to it (they are giving the proceeds to charity, though, so it’s probably better that way). Thanks to Joe, guys with monobrows are now having an easier time than ever picking up women in B’More bars. The decade-long revolving QB door seems to have finally been stopped. All this over a rookie who was listed at #3 on the depth chart at the start of training camp. Kyle Boller and Troy Smith were expected to battle for the position, with Flacco spending a season or two holding a clipboard. However, Boller was injured against the Vikings in Week 2 of preseason, and went on IR. Troy Smith went through a very bizarre illness that started as a tonsil infection, and eventually resulted in his being hospitalized and bedridden for several weeks. That illness cost him the chance to really compete for the starting job, but he would eventually see the field as part of the “Suggs Package.” Smith played well in his specialized role, but whether or not that will be enough for his personal agenda moving forward remains to be seen. His 43-yard hookup with Flacco against the Raiders in Week 8 is a play that Ravens fans will not soon forget. In last year’s season review, we openly campaigned for the Ravens to eschew both Flacco and Matt Ryan in the 2008 Draft, in favor of a CB. Shows you what the hell we know. Whoops. Flacco’s numbers were not dazzling, and as a result he did not garner even one vote for Rookie of the Year. In Baltimore, though, we know that his 60% completion rate, 2971 yards, 14 TDs, 12 INTs, 80.3 rating and 2 rushing scores were far more than just numbers. Joe Cool made some dazzling throws, remained calm and composed in the pocket at all times, kept the chains moving, and brought a sense of competence to the Ravens’ offensive huddle that we haven’t seen since Vinny Testeverde (no disrespect to the 2006 Steve McNair – but that offense never “felt” like this one). Oh, and Flacco is already being widely praised as having one of the strongest arms, and best “deep balls” in the entire NFL. One of Flacco’s main problems to work on in the offseason is ball security when being hit. He fumbled 6 times in his first 6 games, then once in each of 5 consecutive games from Weeks 12-16. He may already be improving though, as he did not drop the ball once in his final 4 games. The future is bright at the QB position in Baltimore. Hopefully those unibrows provide some eye shade, B’More. The Ravens’ 3-headed rushing attack was a welcome surprise in 2008. The team finished 4th in the NFL in rushing yards, at 148.5 per game, an improvement of over 35 yards per game from 2007. Coming into the season, there was some trepidation; Willis McGahee, who put up over 1200 yards in 2007, was coming off preseason knee surgery. Luckily, Cam Cameron saw something special in fullback Le’Ron McClain. McClain was used exclusively as a blocker under Brian Billick, getting only 8 attempts in his rookie season. 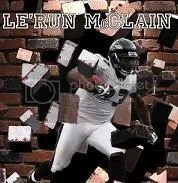 In his sophomore year under Cameron though, McClain blossomed as a runner, leading the Ravens in carries (232), yards (902), and touchdowns (10), earning not only a Pro Bowl nod, but the nickname “Le’Run” here at the Nest. He fancies himself as a poor man’s Jerome Bettis – lofty aspirations for sure. “Pain Train” started to display a tendency to fumble late in the season, so hopefully he will get that corrected before opening day 2009. Ray Rice, the rookie 2nd-round pick from Rutgers, also contributed mightily. His marquee performance came in Week 9 at Cleveland, when he carried 21 times for 154 yards. His role was mostly as a 3rd down back though, and he excelled in that capacity. Rice led the Ravens in yards per carry (4.2), and had more receptions (33), receiving yards (273), and yards per catch (8.3) than either McClain or McGahee. He was a human first down at times, seemingly moving the chains every time he touched the ball, regardless of how long the 3rd down was. Rice was injured in Week 14 against Washington though, and didn’t contribute much after that. We’re very eager to see what Ray Rice is able to do with a season under his belt. Willis McGahee got off to a rocky start with the new regime – he reported to training camp out of shape, then had to miss significant time for surgery. Surgery, some suggested, that he could have taken care of months before. However, Willis was very accepting of his reduced role, at least publicly. He seemed rusty at times, but managed to crack the 100-yard barrier on 3 occasions – in Weeks 7, 10, and 16. He seemed to benefit from McClain busting up opposing defenses early, coming in late and helping to put games away. He had decisive runs down the stretch against Dallas, Jacksonville, and in the Wild Card Playoff in Miami. Willis had a scary moment in the AFC Championship, when Ryan Clark of Pittsburgh lit him up in garbage time. McGahee was taken off on a stretcher, and kept in a hospital overnight. All tests came back negative, fortunately, and Willis is expected to make a full recovery. The Ravens seem to have nothing to gain and everything to lose by cutting ties with McGahee, and his relationship with the coaching staff seems to be mended, so we expect to see him in purple come training camp. The running backs discussion would not be complete, though, without mentioning Lorenzo Neal. Neal, playing in his 16th NFL season, provided great leadership to the young backs in addition to his bulldozing lead blocks. The wideouts benefited from the stability (not to mention shoulder-cannon) of Joe Flacco under center. Both Mark Clayton and Derrick Mason posted fewer receptions than they had in 2007, but Clayton put up nearly 200 more yards, and both saw their yards per catch averages jump significantly. Demetrius Williams caught a 70-yard touchdown in Week 8 against Oakland, but that would be his final catch, as injury again cut his season short. Derrick Mason emerged as Joe Flacco’s go-to guy, his “security blanket,” if you will. The rookie looked his way often, and Mason delivered. Mason’s motives have been questionable in years past – in 2006 he seemed upset with his lack of involvement in the offense on a 13-3 team, and last year he seemed just fine with all the losses, as long as he was getting his touches. This year, however, he put all those character questions to rest by playing through pain that most of us can’t even imagine. In Dallas, Mason had to be helped off the field several times because of his separated shoulder, but still ran around out there with 1 arm, and even caught a touchdown. Playing through the separation caused a domino effect of secondary discomforts for Mason, but he continued to not only play, but remained the team’s most productive receiver. Derrick Mason is on the cusp of deserving a spot in the Ravens’ Ring of Honor. Mark Clayton had a huge game in Week 13 at Cincinnati, catching 5 balls for 164 yards and a score, throwing a TD, and managed a highlight reel 1-handed grab. Still, his inconsistency is incredibly frustrating. He had less than 50 yards in 14 games, including all 3 playoff games. Four years into his career now, Clayton’s production does not justify his 1st round draft pick status. In his defense though, how many QBs has he played with in those 4 years, and of those, how many were worth a damn? We’ll give Mark another year or two with Flacco to right his ship. This was a group that we had high expectations for coming into the year. Dan Wilcox was finally healthy, Quinn Sypniewski was ready to break out after showing some good things in 07, and Todd Heap was going to be the next Antonio Gates under Cam Cameron’s offensive system. There were any number of reasons floated around town to explain this – the Ravens’ young tackles needed extra help blocking, the coaching staff was upset with him for some reason, he had lost a step. In reality, it was probably a combination of all three. Heap finally got involved in Week 10 at Houston, catching 5 passes and his first 2 touchdowns of the year. Heap has played in all 16 games in 5 of his 8 seasons with the Ravens – as far as those years go, 2008 saw career lows from Todd in receptions, yards, and first down receptions, and tied his low in touchdowns. Another worrisome sign from Todd is that he seems to have not broken a tackle since about 2005. The guy just goes down WAY too easily for a tight end. In the Miami playoff game, Heap had a chance to score, but was taken down 1-on-1 inside the 5. In the AFC Championship, Heap was taken down by Troy Polamalu with absolutely zero fight, on a late 3rd down try. The Ravens may have to start looking for Todd Heap’s eventual replacement, as he no longer performs at a Pro Bowl level. A huge question mark entering the season, the offensive line ended up being a bright spot for the Ravens, and a big reason why they ended up in the AFC Championship. This group paved the way for the Ravens’ 4th ranked rushing attack, and protected their rookie quarterback admirably. The signing of Willie Anderson at the end of preseason proved to be a genius move by Ozzie; Anderson was a much needed elder statesman for the young bruisers. The trio of Jason Brown, Marshal Yanda, and Ben Grubbs was expected to be fairly solid, but they played great all season. When Yanda went down for the season in Week 6, the much-maligned Chris Chester (nearly a preseason cut) stepped in more than capably. Chester threw some of the prettiest pull blocks we’ve seen in Baltimore. Brown, an unrestricted free agent (uh-oh) was very impressive in his first season as the full-time center. He is one of the best young centers in the NFL, and unfortunately, the NFL knows it. Watch for the Ravens to have plenty of competition for JB’s services this offseason. Adam Terry played well in spot duty and in Cameron’s “unbalanced line” formations. He is still too nice of a guy to be a dominant NFL tackle, but lack of mean streak aside, Terry had a good year. On the other side, 2nd year player Jared Gaither stepped up in a big way. Forced to try to fill the M&T Bank Stadium-sized shoes of the retired Jonathan Ogden, Gaither transformed himself into a very promising player, and could be a Pro Bowler in the very near future. His size alone is awesome, but he showed quick feet and a good work ethic to go along with it. 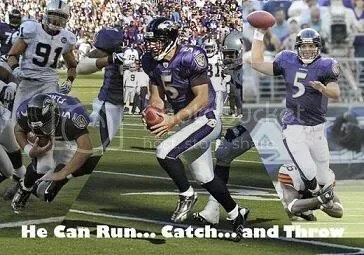 If the Ravens can manage to keep this group together (SIGN JASON BROWN!!!! ), they will be as formidable in the trenches as any team in the league. As Brown, Gaither, Yanda, Chester, Grubbs, and Terry (the oldest, at 26) mature as players together, the sky is the limit. This entry was posted on January 21, 2009 at 5:53 pm and is filed under Ravens, Ravens Season Review. You can follow any responses to this entry through the RSS 2.0 feed. You can leave a response, or trackback from your own site. The Ravens offense certainly delivered more excitement than recent years past, and for that I’m thankful. Standing up in your seat when the quarterback throws a long ball just because you’re so excited to see if the WR is going to get it is a great change from sitting around dully watching 5-10 yard passes and 3 yard runs over and over again. Trick plays made things very interesting, too. I’m looking forward to next year! Oh, and I heart Joe. Another great article. Keep up the good work! 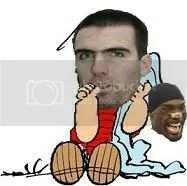 And I LOVED the Linus Flacco pic!